Yesterday was the 25th Worldwide SketchCrawl. I'd never heard of it until someone on Twitter mentioned it, but as soon as they did, and said that they wanted to do a Brighton one, I was determined to take part. It seemed like a manageable way to ensure that I did some drawing, instead of endlessly dreaming about having the time to do so. The idea is that for one day, every few months, a group of people sketch around town in much the same way as you might have a pub crawl. Of course, the issue is that weekends are my only Item time, but as it happened, Item had been invited to a drop-off party from 2.30, so with some generosity from The Boy, we were able to sort it out so that she joined in for the first hour, and then I had four hours' drawing with the adults. The original woman who had mooted the idea on Twitter was Kay Sexton, a local blogger/freelance writer/aspiring novelist. I'd never met her, but we had a few exchanges about the logistics of the event, and then I set up a Facebook event and invited everyone remotely local and arty, and she invited her friends too. We had quite a good turn-out, really (lots of the other Sketchcrawls around the world report only two or even one participant): two of my colleagues, plus one of their daughters; an old friend of mine who is an illustrator, her friend who (I think) had seen it independently on Facebook); Item's friend Trilby, and then a bloke Kay knew, plus a Sardinian woman who had come down, as far as I could follow, to interview Kay for some reason or other, and had been roped in. Kay had suggested meeting inside the enormous plate-glass windows of the library, which was a great idea. I'd anticipated drawing folk in the square outside, but actually, it was filled with little wooden huts for the outdoor Christmas market, and the view from the window was simply the rear of these - but it turned out that the many folk who had just come along for a sit-down and a read made excellent (if rather unstill) subjects. I have to admit that I am not one of those effortless parents: Item was very good, and sat and drew nicely (from her imagination), but I didn't feel I could properly relax until she was gone. One of the other sketchers, an illustrator, showed me some lovely cartoony pictures she had drawn of Item in her two outfits (The Boy changed her into her party dress just before they went off). After an hour, we fancied a coffee, so we all went up the road to Starbucks, which was ok for drawing, but so crowded that it was hard not to feel like we were hogging seats after we'd finished our drinks. Mind you, there were some brilliant characters to draw in Starbucks. So, then, I suggested the Marwood, that super coffee place I'd stumbled into on my birthday. On that day, I'd been the only customer: now, it too was busy, but we were extremely lucky and bagged a large table (ie a door on trestles) just as a group were leaving, and it couldn't have been a better spot for drawing people and the many bizarre objects on the walls and counters. 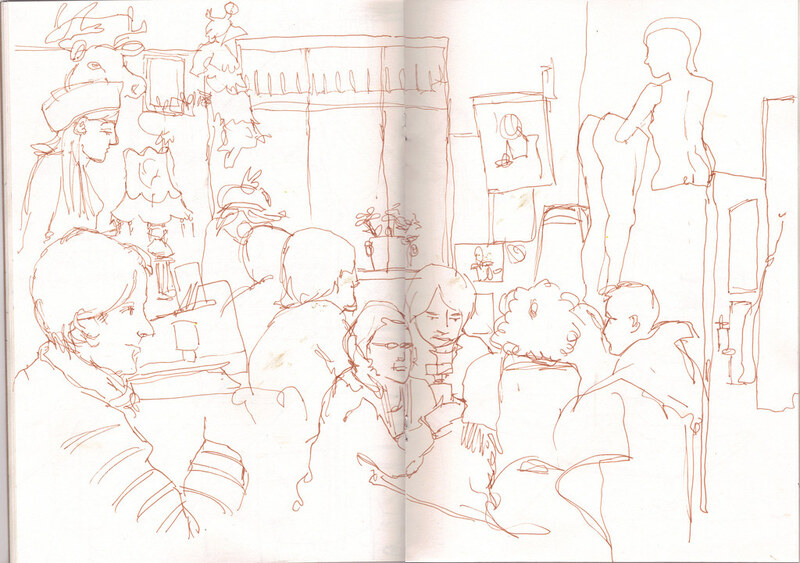 After a while there, Kay and Francesca needed somewhere quiet to do their interview, so we headed back to the library and I went off on my own upstairs, where I did my best sketch of the day, of the people sitting below, seen from above. I'd taken a fair amount of materials with me, but for future reference I think I'll need much less, especially for a half-day like this. Almost everything I did was a line drawing with the intention of adding paint at home. The best decision was the cheap sketchbooks from Clarkes, which are 20-odd pages stapled together in a card cover - they don't feel intimidating and are cheap and quick to fill up. It was nice that Item could have one too. The other hit was the brushes you can fill with water, so you don't need to worry about knocking a pot over - especially good for the kids. 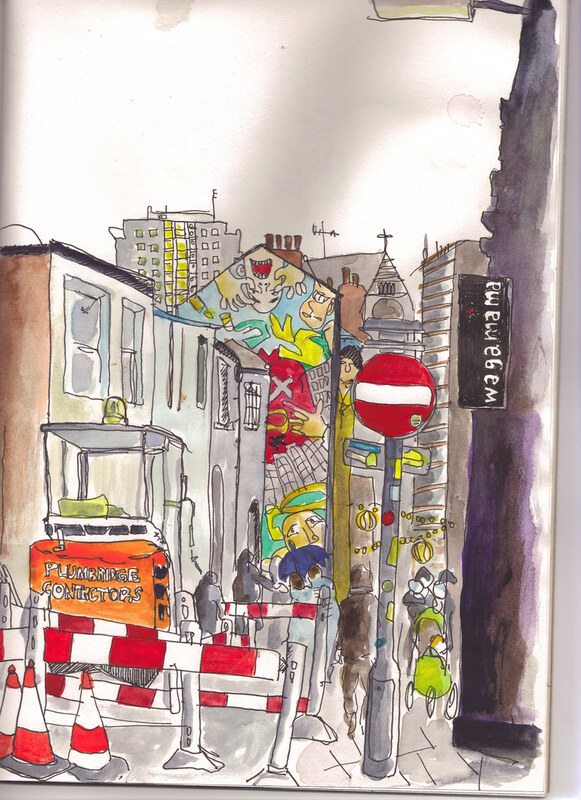 This morning, I have been enjoying looking at results of Sketchcrawls from all round the world, from Greenland to Brisbane. It's wonderful to see that so many people were doing the same as us, and to get a glimpse of the different urban environments and climates that were occurring while we were huddled indoors behind steamed-up windows. Sketchcrawls happen every few months, which is good, as I'd like to make a commitment to carry on, and that is about as often as I ought to skive off childcare (always assuming that, eventually, Item will become mature enough to participate more meaningfully herself). There was some loose talk of having a rolling event every month, but I don't know if I ought to be the one to arrange that if I can't commit to being there at first. Here are all my sketches.